When it comes to most things in life, anything and everything can go wrong at any given time. Sometimes, it can be something minor, a case where you’ll panic about it now and laugh about it tomorrow. At other times, it can be devastating, leaving severe injuries or even causing the deaths of hundreds of people. When an incident isn’t caused by human error, it’s often technology that decides to betray us and malfunction. Imagine an everyday item like your coffee mug exploding in your face, or you and your coworker’s beloved Apple devices suddenly ceasing to work despite the fact that everyone else’s devices are fine. How about even worse cases where a malfunction can cause a multimillion-dollar telescope in space to stop working or a cruise ship to tip to the side? Recently, IKEA was ordered to pay a Beijing woman $8,000 due to the fact that she suffered severe injuries when one of their clear glass mugs exploded in her face. The woman, who’s only referred to by her surname Wang, was using IKEA’s Stelna cup to drink a hot beverage when it shattered. The cup broke one of her front teeth and cut her lip, not to mention the fact that the unexpected blow knocked her unconscious. 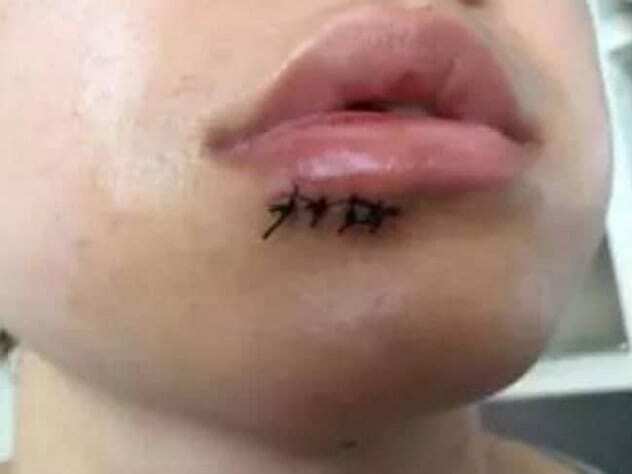 She was admitted to a hospital and had to get four stitches in her lip. Wang had to visit the hospital 12 times after the incident, which also had a severely negative psychological impact. Ever since then, she’s easily startled by loud noises and suffers from depression. She filed a lawsuit against IKEA seeking approximately one million yuan (about $200,000) in damages. IKEA’s lawyers defended the safety of their Stelna mug by providing extensive test results confirming its durability. The court ultimately ruled that there wasn’t an adequate amount of evidence to prove that the mug was flawed but ordered IKEA to compensate Wang for her injuries as well as give her a refund for the Stelna mug. 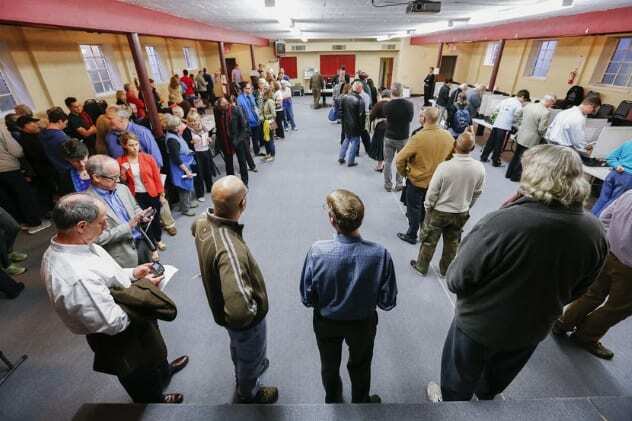 Both sides were unhappy with the ruling, which was upheld by an appeals court. 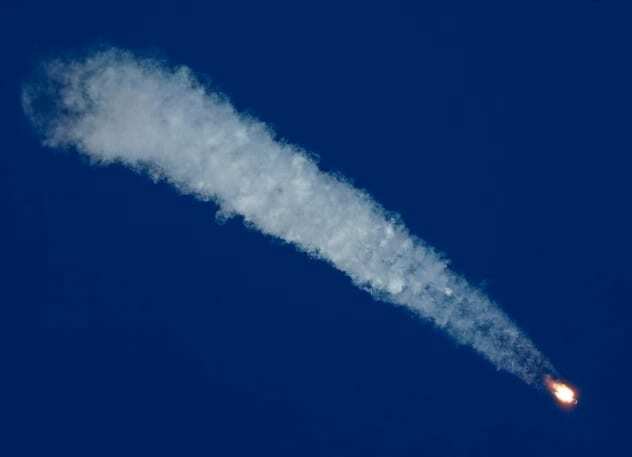 Early in October 2018, a Russian Soyuz, one of the longest-serving and most renowned rockets, suffered a rather serious launch failure shortly after liftoff. This incident took place during a routine crew trip to the International Space Station, and the rocket was transporting NASA astronaut Nick Hague and Russian cosmonaut Alexy Oychinin. Even though both astronauts landed safely, investigations were still conducted to determine what went wrong. At first, NASA blamed it on a problem that occurred during booster separation, which triggered a warning light to turn on inside the crew capsule. This automatically fired engines that carried the crew capsule away from the troublesome booster and, of course, the flammable rocket fuel. After a few minutes of free fall, the capsule’s parachutes deployed, and it safely made it onto land, where the two astronauts were met by a Russian search-and-rescue team. After being examined, the astronauts made their way back to Baikonur Cosmodrome in Kazakhstan to reunite with their family members and officials. Whatever caused the anomaly was of deep concern to NASA, but what made officials express their confidence was the fact that everything aside from the anomaly was working perfectly. The crash of Lion Air Flight 610 that recently claimed the lives of 189 people off the coast of Jakarta may have been due to a technical malfunction, discovered during an investigation as to why the tragedy took place. According to investigators who analyzed the flight data recorder, an air speed indicator had been malfunctioning for the last four flights of the doomed Boeing 737 MAX 8. The head of Indonesia’s National Transportation Safety Committee, Seorjanto Tjahjono, said that detailed inspections were being formulated, with the NTSB and Boeing to perform detailed checks regarding the air speed indicators of this specific aircraft model. Captain Nurchahyo Utomo of the Transportation Safety Committee (KNKT) explained that there were two air speed indicators in the cockpit of the plane. One belonged to the pilot and the other to the copilot, and one of them must have reacted to the malfunction in his display. The plane was said to be in “good shape” before it crashed 13 minutes after takeoff. However, authorities have confirmed that the pilots flying the same plane on another route the day before the crash had experienced technical issues. 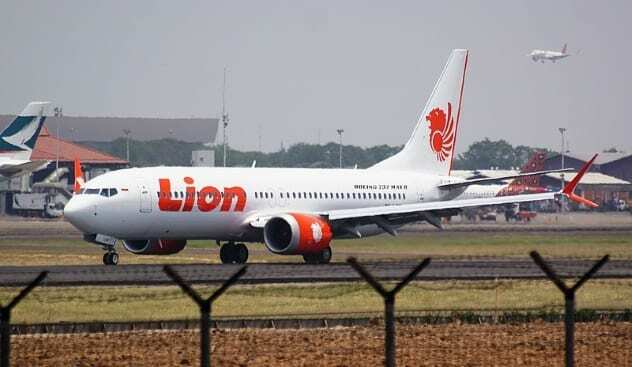 Boeing and Lion Air declined to comment, pending further investigations to clarify the exact cause of the crash, but the malfunctioning air speed indicator is already a big piece of the puzzle. According to a Reddit user named “harritaco,” an MRI machine was being installed and tested at their workplace when more than 40 people noticed that their Apple products had stopped working. This included iPhones and Apple Watches. Strangely enough, Android users didn’t experience any long-term issues with their devices. 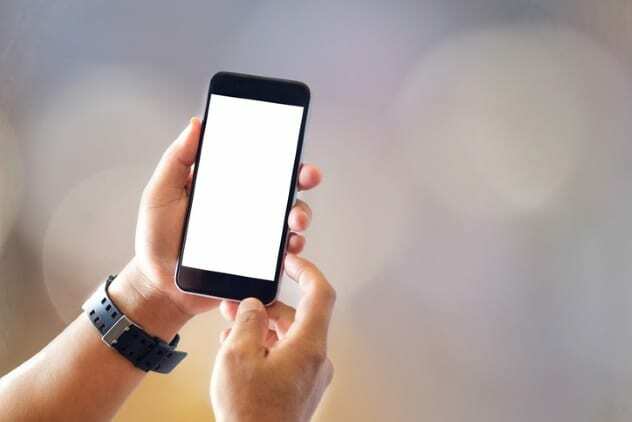 Even though the Redditor wasn’t surprised to see an electromagnet have such an effect on electronic devices, they found it strange that it only affected iOS devices. Another Reddit user named “captaincool” proposed that it could have been the liquid helium used to cool the magnets of the MRI machine. In October 2018 in Saint John, New Brunswick, Canada, a massive oil refinery blast shook the historic port city. Flames and black smoke could be seen coming from the refinery, and officials were relieved to tell local residents that only four people suffered from minor injuries. The explosion took place at around 10:00 AM. The blast was loud enough that one resident, Litsa Daeres, thought it was her house’s furnace that exploded. According to the chief of Irving Oil, Kevin Scott, there had been a malfunction with the refinery’s diesel treating unit, where sulfur is removed from diesel fuel. One worker said the blast was so intense that it was enough to knock him down. The refinery shut down production for the day, and it took a few hours to extinguish the resulting fire. 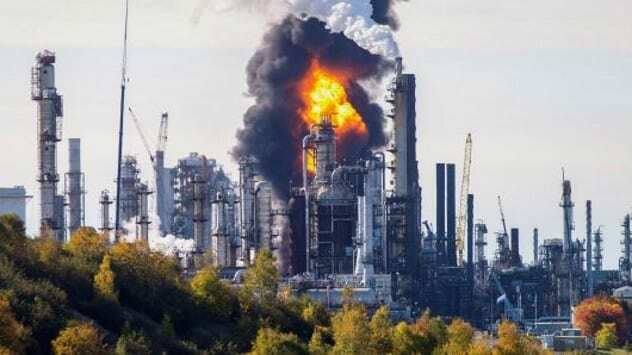 Soon, the refinery was declared safe to enter, with the damaged part isolated and contained. The Hubble Space Telescope has streamed back useful data on subjects such as dark matter and how planets are able to form for well over 20 years. In October 2018, it started experiencing difficulties with its gyroscope, which helps the telescope turn and lock on to new targets. The gyroscope has two modes in which it operates, one being a “high” mode for when the spacecraft turns between targets and the other being a “low” mode, which is usually activated to help Hubble stay still and locked on a target. A backup gyroscope within the telescope started to spin at extremely high rotation rates, which forced NASA to execute a running restart by turning off the gyro and then quickly turning it back on again. This was essentially done by flipping a switch off and back on. After a series of maneuvers to clear any and all blockages from the gyroscope, it has managed to spin at normal rates. 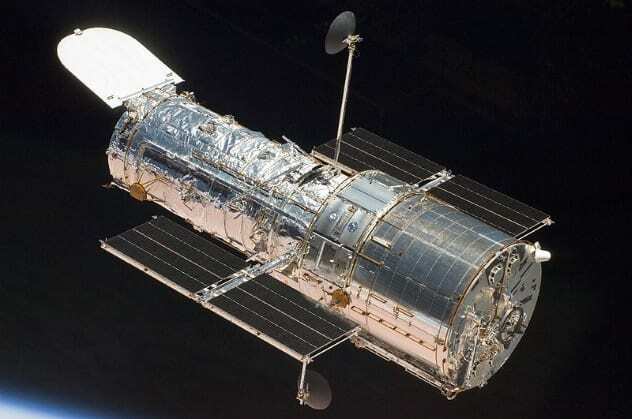 Additional tests have to be performed before Hubble can return to normal operations, which includes moving the telescope between targets and precision pointing tests. During the 2018 midterm elections in the US, states all across the country experienced severe complications due to malfunctioning voting machines, often leading to long lines and even some voters leaving without casting a ballot. According to a report from the Brennan Center for Justice, a public policy think tank, the reason why this was happening was quite simple: Most of the voting machines are incredibly old. In fact, 41 states are using systems that are at least a decade old, and 33 states need to replace their machines by 2020. Surprisingly, 43 states are using machines that aren’t even manufactured anymore. This means that these machines are more likely to malfunction, and since they’re no longer in production, they can be hard to repair. This is due to the fact that the software is outdated and that replacements for broken parts are nearly impossible to come by. These difficulties make the voting systems less reliable and, more importantly, less secure. Some election officials have admitted to scavenging for spare parts on sites like eBay, where such parts are still hard to find. State and federal lawmakers will have to dedicate more funding toward updating these voting machines before the next major election year or risk public outrage for the machines breaking down completely or causing voting inaccuracies. One of the world’s best-known artists, Banksy, recently posted a video to his website explaining that the partial shredding of his latest artwork was a malfunction. It should have shredded completely. The artwork in question, known as Girl With A Balloon (or Love is in the Bin), shows a young girl reaching for a heart-shaped balloon. It was put on auction at Sotheby’s in London, and just after it was sold, the canvas fell through a hidden shredding mechanism in the frame. Yet, it stopped shredding the canvas right above the girl’s head, leaving the balloon intact. The auction continued despite the crowd being shocked by the act. The winning bidder, an unnamed European collector, was still willing to buy the partially shredded artwork for more than $1.86 million. People aboard a Carnival cruise ship got the fright of their lives in October 2018 when the ship started tipping to one side, so much so that plates, glasses, and various other items started to slide, understandably causing everyone to panic. This incident took place shortly after the ship departed from Florida and lasted for about one minute. One of the passengers said that it was normal to feel the ship rock back and forth, except this time it didn’t rock back. Photos taken of the aftermath of the ordeal showed shattered glasses and plates scattered across the dining room floor. Another passenger took to social media to say how horrifying it was to see water pouring out of the pools. 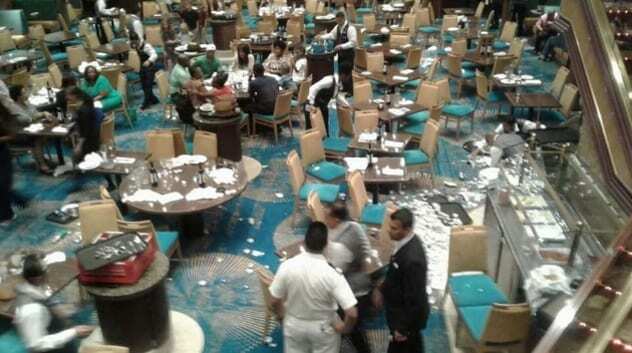 The cruise line issued a statement noting that everything was back to normal after the tilt. Despite the disruption caused by the malfunction, the ship remained fully functional and continued on its Caribbean cruise route. The minister of public safety in China shared footage of a boy urinating in an elevator to encourage parents to keep their kids under control. The footage was taken from an elevator in a building in Southwest Chongqing in February 2018 and depicts a young boy urinating on the buttons of the elevator. Of course, this caused the elevator to short-circuit. The boy can be seen becoming visibly distressed as the lights start to flicker and the elevator doors repeatedly open and close. The boy had to be rescued from the elevator. The authorities contacted the boy’s father about the incident, yet he disputed the video’s authenticity. The father simply couldn’t believe that his son would be able to urinate that high. When asked, the boy denied that he did it. The video was shared on social media, with most users agreeing with officials that the boy must be given better discipline at home. Some users encouraged others to see the funny side of the situation, saying that it’s “admirable” that he has the skill to urinate that high. READ MORE BLURB GOES HERE List 1 Title and List 2 Title.